Pharmaceutical Name: Radix Gentianae macrophyllae. Botanical Name: 1. Gentiana macrophylla pall. ; 2. Gentiana crassicaulis Duthie ex Burkill; 3. Gentiana dahurica Fisch. ; 4. Gentiana straminea Maxim. Common Name: Large-leaf gentian root. Part Used & Method for Pharmaceutical Preparations: The roots are dug in spring or autumn. After the fibrous root bark has been removed, the roots are cleaned, dried in the sun and cut into slices. Meridians: Stomach, liver and gall bladder. Functions: 1. To dispel wind and dampness; 2. To clear heat caused by yin deficiency. 1. 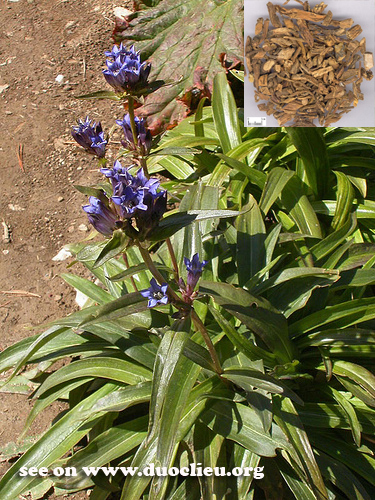 Wind-damp obstruction syndrome: a) pain with heat signsLarge-leaf gentian root (Qinjiao) is used with Tetrandra root (Fangji) and Honeysuckle stem (Rendongteng); b) pain with cold signsLarge-leaf gentian root (Qinjiao) is used with Notopterygium root (Qianghuo), Pubescent angelica root (Duhuo), Cinnamon twigs (Guizhi) and Prepared aconite root (Fuzi). 2. Afternoon fever caused by deficient yin. Large-leaf gentian root (Qinjiao) is used with Sweet wormwood (Qinghao), Turtle shell (Biejia), Anemarrhena rizome (Zhimu) and Wolfberry bark (Digupi) in the formula Qinjiao Biejia Tang. 3. Damp-heat jaundice. Large-leaf gentian root (Qinjiao) is used with Oriental wormwood (Yinchenhao) and Capejasmine (Zhizi). 4. For rheumatic or rheumatoid arthritis with muscular contracture and severe joint pain, it is used with Radix Aristolochiae Fangchi (Fang Ji), Radix Angelicae Pubescentis (Du Huo), and others. Cautions & Contraindications: This herb is contraindicated for a person with a weak constitution or in cases suffering from diarrhea.